Southampton will be without striker Charlie Austin for "several weeks" because of a hamstring injury, according to manager Ronald Koeman. Austin was injured during Tuesday's 2-0 defeat at Bournemouth, limping off after an hour at the Vitality Stadium. The 26-year-old, who joined Saints from QPR in January, scored the winning goal against Manchester United on his debut. But he has failed to score in his four subsequent appearances, including two successive starts. 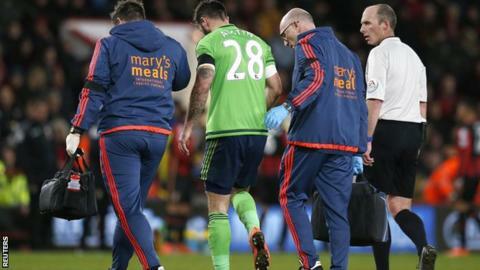 Fellow forward Shane Long took a knock to a knee at Bournemouth, but his injury is not as serious. Steve Cook and Benik Afobe scored as Saints lost a league match to the Cherries for the first time since 1958. Manager Ronald Koeman changed his formation from 3-5-2 to 4-4-2 in the first half, but said his side's defeat had more to do with attitude than tactics. "We've played this system for several weeks - the system is perfect if you play against two strikers," said Koeman. "But I had to recognise the left full-back of Bournemouth [Charlie Daniels] was very good, he created a lot of problems. "There was a big difference with the way Bournemouth started the game. They were hungry and winning challenges. We didn't, and that's not tactics - that's belief, spirit, character, mentality. "If you analyse the game and ask every player of Southampton, 'did you win or lose more battles?' all 10 will recognise they lost more." He added: "Normally I like to defend the players, but not this time, I think. Bournemouth were more hungry than we were."